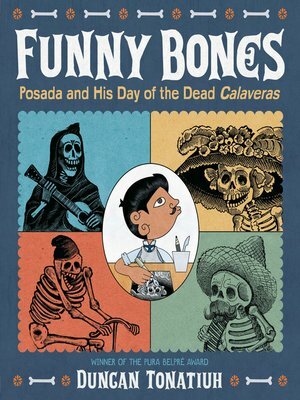 Funny Bones tells the story of how the amusing calaveras—skeletons performing various everyday or festive activities—came to be. They are the creation of Mexican artist José Guadalupe (Lupe) Posada (1852–1913). In a country that was not known for freedom of speech, he first drew political cartoons, much to the amusement of the local population but not the politicians. He continued to draw cartoons throughout much of his life, but he is best known today for his calavera drawings. They have become synonymous with Mexico's Día de los Muertos (Day of the Dead) festival. Juxtaposing his own art with that of Lupe's, author Duncan Tonatiuh brings to light the remarkable life and work of a man whose art is beloved by many but whose name has remained in obscurity. The book includes an author's note, bibliography, glossary, and index. Duncan Tonatiuh was born in Mexico City and grew up in San Miguel de Allende, Mexico, where he now lives. He travels extensively in the U.S., visiting schools, libraries, and bookstores.